We understand how difficult it is to get hold of the desired number of railway tickets according to your schedule and budget. With the sole purpose of relieving you from the stress and saving your time, Yadav Travels offers the best-in-class Rail Ticketing Services. Call us today and allow us to book for you, your desired coaches, seats and berths under your budget. 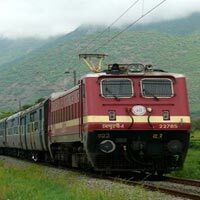 Based in Patna, Bihar, our vast network of operations allows us to book railway tickets in the â��tatkalâ�� quota as well.